Researchers at the Indiana University Observatory on Social Media have launched upgrades to two tools playing a major role in countering the spread of misinformation online. 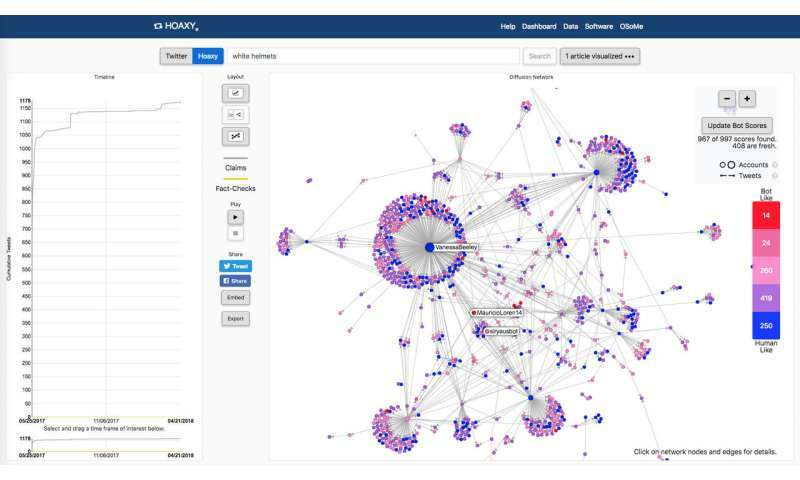 The improvements to Hoaxy and Botometer are supported by the Knight Prototype Fund on Misinformation, a joint venture of the John S. and James L. Knight Foundation, the Rita Allen Foundation and the Democracy Fund to address concerns about the spread of misinformation and to build trust in quality journalism. A third tool—an educational game designed to make people smarter news consumers—also launches with the upgrades. "The majority of the changes to Hoaxy and Botometer are specifically designed to make the tools more usable by journalists and average citizens," said Filippo Menczer, a professor in the IU School of Informatics, Computing and Engineering and a member of the IU Network Science Institute. "You can now easily detect when information is spreading virally, and who is responsible for its spread." Hoaxy is a search engine that shows users how stories from low-credibility sources spread on Twitter. Botometer is an app that assigns a score to Twitter users based on the likelihood that the account is automated. Hoaxy's new functions show users which stories are trending on Twitter, including those from low-credibility sources. It also indicates what proportion of the users who are spreading the stories are likely to be "bots." These new features were previewed April 12 at the International Symposium on Online Journalism in Austin, Texas, by Giovanni Luca Ciampaglia, a research scientist at the IU Network Science Institute who is part of the team that developed the tools. The new version of Botometer employs updated machine learning algorithms to identify "bots" with greater accuracy and is strongly integrated with Hoaxy. Users can observe not only how information spreads across Twitter, but also whether these messages are mostly shared by real people or pushed by a computer program potentially designed to sway public opinion. 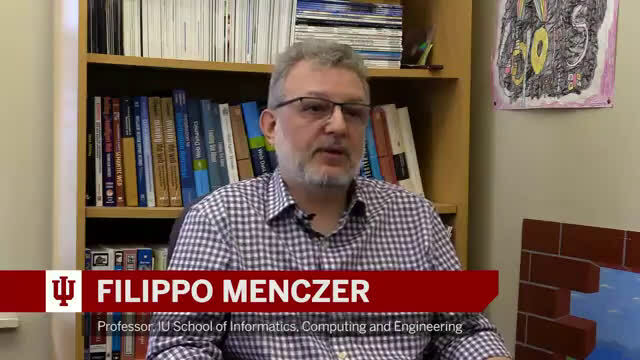 Automated accounts are commonly used to give the false impression that a large number of people are speaking about a specific topic online, Menczer said. Political campaigns, celebrities and advertisers are known to use bots to push specific agendas or products. The updated Hoaxy also has a "trending stories" section that displays popular news stories along with claims from low-credibility sources. This is possible because Hoaxy can now trace the spread of any online news story or hashtag over time across Twitter. Previously, users could only analyze headlines from specific websites identified by nonpartisan groups as likely to post false or misleading information. Ciampaglia said Hoaxy and Botometer currently process hundreds of thousands of daily online queries. The technology has enabled researchers, including a team at IU, to study how information flows online in the presence of bots. Examples are a study on the cover of the March issue of Science that analyzed the spread of false news on Twitter and an analysis from the Pew Research Center in April that found that nearly two-thirds of the links to popular websites on Twitter are shared by automated accounts. The newly launched project is Fakey, a web and mobile news literacy game that mixes news stories with false reports, clickbait headlines, conspiracy theories and "junk science." Players earn points by "fact-checking" false information and liking or sharing accurate stories. The project, led by IU graduate student Mihai Avram, was created to help people develop responsible social media consumption habits. An Android app is available, and an iOS versions will launch shortly. All three tools are united through their creators' goal to help individuals understand the role of misinformation online, Menczer said. "By partnering with other groups," he added, "we're able to significantly amplify the power of our work in the fight against online disinformation."